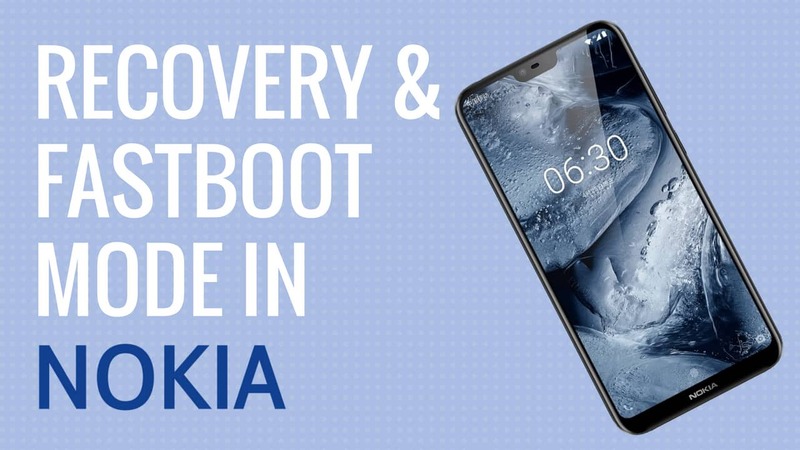 Nokia Android phones (2017 & 2018) use a slightly different method to reach the fastboot or recovery mode. In this post you will learn the key combinations and ADB commands to enter the recovery mode & download (fastboot) mode on Nokia phones. The same steps work on all Nokia Android smartphones. These include – Nokia 2, Nokia 3, Nokia 3.1, Nokia 5, Nokia 5.1, Nokia 6, Nokia 6.1, Nokia X6 (Nokia 6.1 plus), Nokia 7, Nokia 7 plus, Nokia 8, Nokia 8 Sirocco. Shut down your Nokia smartphone. Connect a USB cable (charger or PC) and wait for the device to start charging. Press and hold Volume Up & Power key(s) together. Release the power button upon vibration, but keep the volume key pressed. Your Nokia phone should boot into recovery mode. If you see a “No Command” screen, then follow the steps in the next section. Press and hold Power key and quickly press and release the Volume Up key. Release the power key when you see the recovery options. Touchscreen does not work in recovery mode. So, use the volume up/down key(s) to highlight the relevant option. Then use the power key to select it. You can also send the following command via ADB to reboot your Nokia to recovery mode. Developer options and USB debugging needs to be enabled in phone settings for this to work. If you reach a “No command” screen, then follow the steps mentioned in the previous section. To exit from the stock Nokia recovery, simply choose “Reboot system now” option in the recovery. Download mode on Nokia Android smartphones is equivalent to the fastboot or the bootloader mode. You can send all fastboot commands that are supported by Nokia phones. These include bootloader unlock, booting a custom recovery or any other fastboot function. Connect the charger or USB cable and wait for the device to start charging. Now, press and hold Volume Down + Power key(s). Keep the keys pressed until the device vibrates again and you see Download Mode written on the top left of the screen and a Powered by Android logo in the middle. The easier way to reach download mode on Nokia is using adb command. If you have connected your Nokia to the PC, then use the following ADB command to reboot the device to fastboot/bootloader mode. You can also use the recovery mode to reboot the Nokia device in fastboot mode. Just select the “Reboot to bootoader” option from the recovery mode. You can exit download mode on Nokia by issuing the following fastboot command. This should reboot the device normally. Alternatively, you can use the key combination to soft reset the Nokia phone to exit the download mode. Press and hold Volume Up & Power key(s) for 10-12 seconds until the device vibrates and restarts. I am having an issue with my nokia, when I turn it on, it is stuck on the download mode. There is the androidone logo and “Download mode” on the upper left corner. I tried to “Press and hold Volume Up & Power key(s) for 10-12 seconds until the device vibrates and restarts” like you suggested but the device is still on this mode. What can I do else?